I honestly have to say that this is one of the most original stories I have read in a long time. Of course, there are still similarities to the aspects of paranormal stories, like extraordinary abilities, etc. But on the whole, I found this story to be pretty unique. I loved seeing Allie grow out of her shell and discover the world she belonged to. I also really loved the glimpses into some of the past history of the people she meets and becomes really close to. It's one of the main things that made this story stand out from all the other paranormal books I have read before. Besides the main character herself, there are lots of other supporting characters in this story and unfortunately after a while, I sort of lost track of who is who and how they are related to one another. But what I can say is that all of them were absolutely awesome! Not only were they humorous, super supportive and understanding, but it was very clear that they all adored Allie and were very protective of her. As for our main protagonist Allie, let's just say that she is one feisty, stubborn, redhead. But what I really loved about Allie's character was that she wasn't always this super tough person. Allie struggled a lot with adjusting to her new reality and had moments where she felt overwhelmed by everything and was even scared. These things really helped bring Allie to life and made her feel like a real teenage girl and not just another character. Also, I loved how Allie didn't allow herself to be pressured by anyone for anything. She made her own decisions and stuck with them. One of my favorite things about this book was its emphasis on the close bond between Allie and all the others like her that she met. I really loved how they were more like a close family to her rather than just friends. My favorite thing was that it really emphasized the strong bonds between people that weren't related by blood in any way. I loved the whole concept of being able to bond with others as family even though they might not be related biologically in any way. Like I said before, I really loved all the characters in this book. But relationship wise, I didn't really like how Aiden or Allie decided things. In most of the book, Aiden was pining away for Allie, while Allie was with Vince. Secretly, I was rooting for Aiden, but I don't agree with all his actions. And as for Allie, I get why she didn't want to become involved with Aiden, but I didn't really like that her biggest reason for choosing to stay with Vince was that he was an escape and a semblance of normal. In my opinion, if the main reason someone is involved in a relationship with someone else isn't love, then they shouldn't be together. I am not saying that Allie didn't care about or love Vince. She did love him in a way, but it wasn't her main reason for being in a relationship with him. And also, I felt it was hard to fully understand Allie's relationship with Vince since it really wasn't shown all that much throughout the book. Aside from that, I also didn't like how Aiden kept persuing Allie even though she was already dating someone else, and his cold behavior toward Allie when she rejected him. I am still hoping that they eventually get together, but I am also really curious to see if they actually turn out to be complements or if they both have other complements. Unfortunately, one of the things that bothered me was the bond between Allie and her adoptive parents. In the beginning of the book, Allie talked about how she loved her parents, but as the story progressed, they seemed to just disappear and except for a brief mention here and there, we really didn't see or learn more about them. The same was with Vince. He seemed to be a big part of Allie's life, especially since she was dating him, and he was present for like the first half of the book. But as with Allie's adoptive parents, after a while he too seemed to just disappear, and was only briefly mentioned every once in a while. I really enjoyed reading this book! It was a fast read and I was hooked from the start. This book, like every other book, had its flaws but overall it was a great and unique story. I am definitely looking forward to reading the sequel when it comes out, and I can't wait to find out more about Aiden and Allie in the prequel! Seriously, this was a really enjoyable book and I loved every second of it! I definitely recommend checking it out if you are looking for a new book to read. 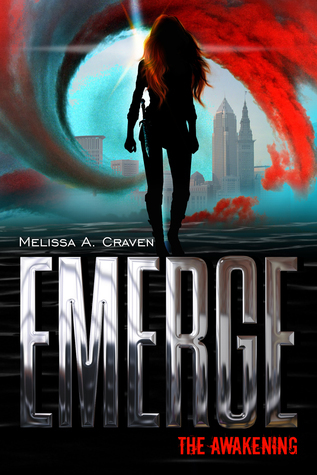 Thank you for the wonderful review of Emerge. I'm so glad you enjoyed book one.